The bedrooms were disastrous when we first bought the house. We had no choice but to tear everything out, down to the 120 year old studs. Due to the unevenness of the studs, we couldn’t hang drywall. Rather, we had to rebuild the plaster walls. It was a long, hard, messy job. One of the second floor bedrooms. You can see a chink of daylight coming in through a small hole in the wall above the window on the left. The brass and crystal door hardware throughout the house was exquisite though and I was able to restore it. Due to the extent of the construction, for the first eight months of my daughter’s life, she couldn’t stay in the house. I wanted so badly to give her a lovely nursery with her own crib and a place for her things, but I simply couldn’t because of the extensive renovations. Our lives were so transitional at that time. During the dangerous renovation phase, we stayed at my in-laws’ house and the baby slept in a play pen in a small bedroom. Baby G.G. in her playpen. 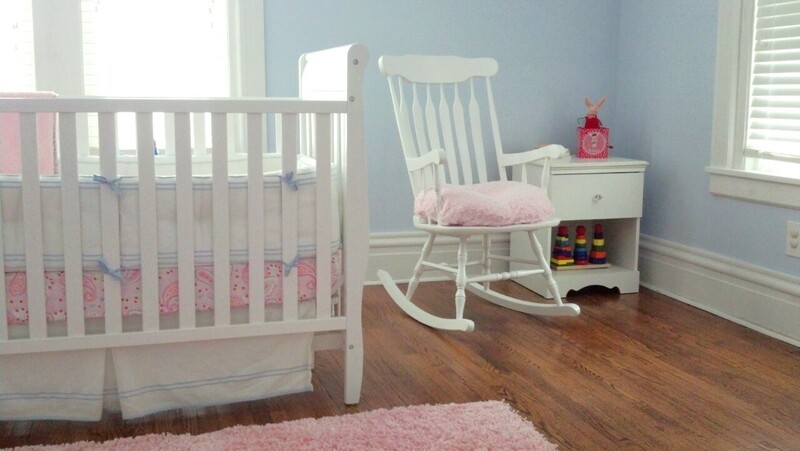 Once I got pregnant, I decided that the nursery would be blue regardless of whether I had a girl or a boy. I figured that if I had a girl, I could add pink accents or if I had a boy, I could add navy blue accents. Everyone assumed I would be having a boy because my choice of nursery color, but I think blue can work really well in a girl’s nursery. It was such a relief to move my daughter into our home and into her new room. This is a place where she can play, learn, and grow. This is a place where she can feel safe and secure. 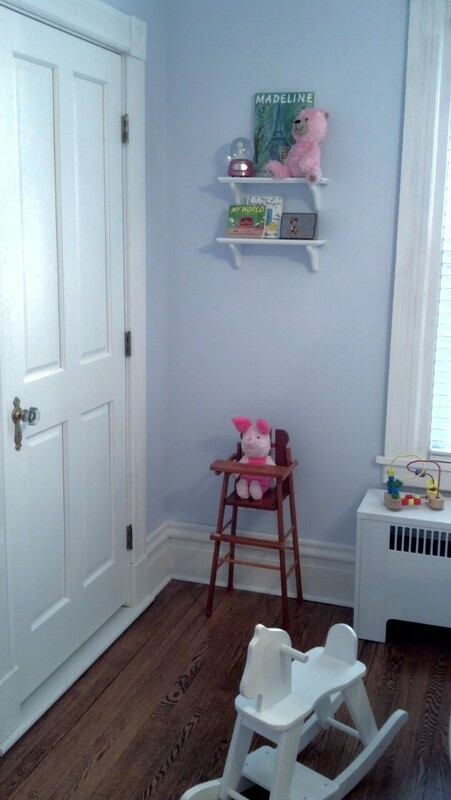 Now, she is twenty months old and she loves her nursery. There are a few small projects left in the room and I need to add some pink valances above the windows, but it’s mostly finished! My great-grandmother’s wood framed mirror was sitting in storage so I repaired some cracks in the wood and spray painted it glossy white. It fits perfectly with the decor and I love that my great-grandmother used this mirror in her house many years ago. Also, I thought pom-poms were a cute idea so I made some and hung them from the ceiling. I added this glittery canvas from Home Goods to fill the space on a large wall. The dresser belonged to my aunt. She had used it in her son’s nursery fifteen years ago. It was originally a natural wood finish, but I painted it white to match with the rest of the furniture in G.G.’s nursery. I found this teddy bear in a bag of my old stuffed animals. I remember buying this when I was seven or eight years old. I was proud of this purchase because I saved a long time to buy this bear. My daughter loves hugging it so I’m glad that it’s giving her the joy that it used to give me. I saw this rocking horse at a consignment shop and I had to have it since it fit with the decor. I set it up in the corner by G.G.’s closet. 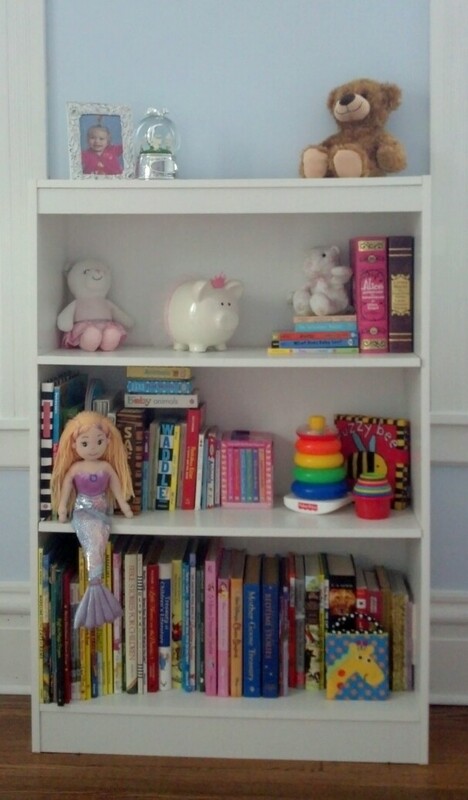 I added shelves and put some books and knickknacks on them, such as a Pinocchio jewelry box G.G.’s grandparents brought her from Italy and an engraved snow globe her cousin gave her for her baptism. The little, brown baby-doll high chair used to belong to my mother when she was a young girl, then it was passed to me, and then to my younger cousin. For my shower, my aunt and cousin gave it back to me to pass on to my daughter. 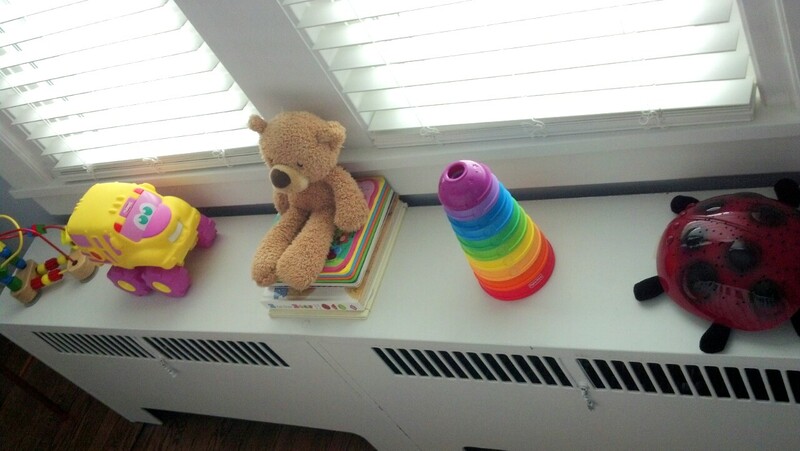 I decided to use the radiator cover as an easy access shelf for some of my daughter’s favorite toys and books. Since we were living in transition for the first eight months of my daughter’s life, we could not set up her crib for her. 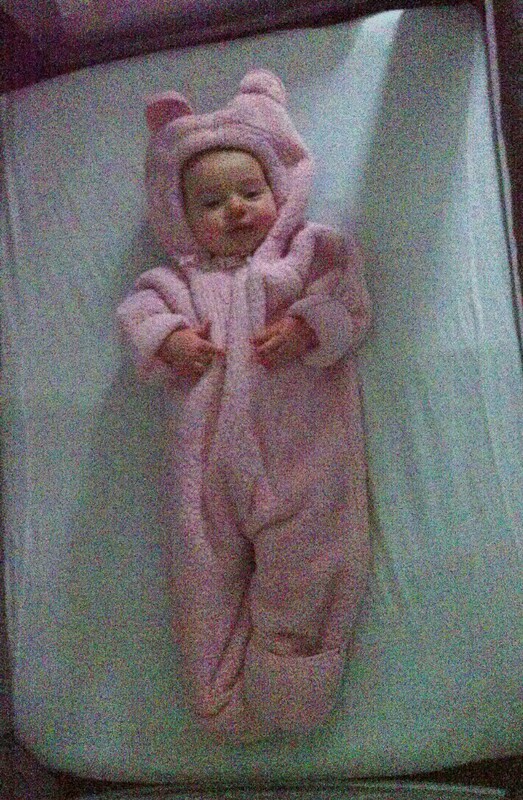 This is why she was sleeping in a playpen. I was worried that she would refuse to transition into a crib at such an old age, but she did fine. The Pottery Barn bedding doesn’t fit the crib properly because I guess the company makes the bedding to fit their specially sized cribs. I find that to be rather annoying, but I have made do with it. I never found a comfortable, pink rocking chair cushion so I just covered a Boppy pillow with a baby blanket. I found a pink rug on eBay for a very reasonable price and it matches so well with the rest of the room. My best friend from college has her doctorate degree in English so she got me a bookshelf for the baby shower. This is my daughter’s favorite part of her room. She loves her books and spends a lot of time perusing the titles and selecting her favorites to read for the day. Finally, I love the mini chandelier. 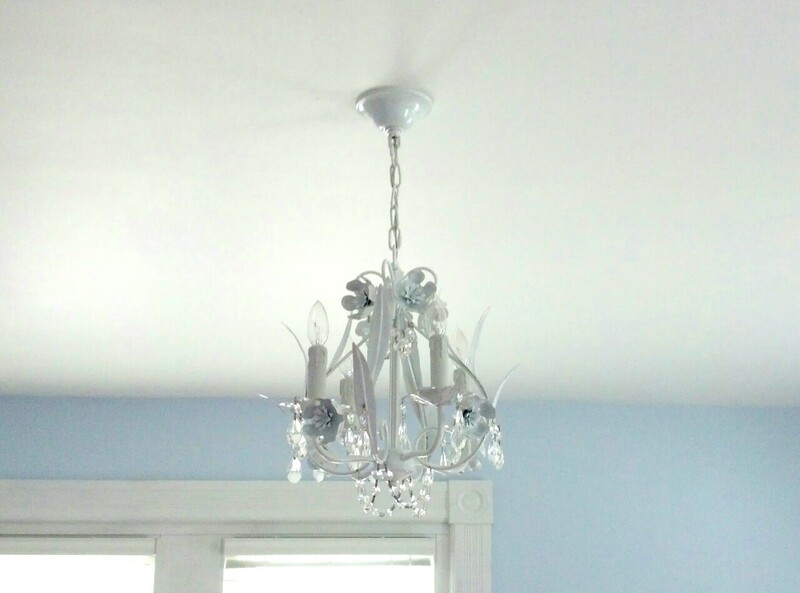 I think it is so cute with its metal flowers and crystals and it adds a bit of sophistication to the room. Although my daughter didn’t have her own space for the first eight months of her life, now she has a space that she loves. I can’t wait to get some chrome curtain rods and add some pink valances. That should finally complete the look of the room. It sure has come a long way over the past two years! 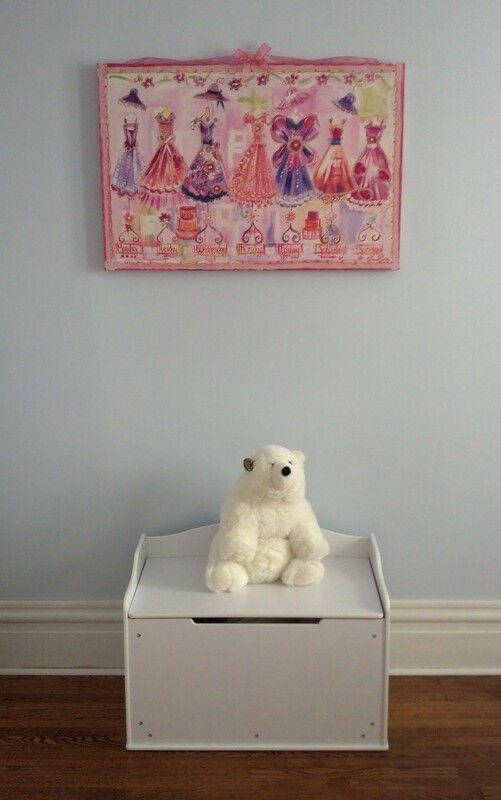 This entry was posted in Home and tagged Blue Nursery, Girl Nursery, Home Renovations, Nursery Decor by Candid Mama. Bookmark the permalink. Thank you so much! We had tons of pictures from when we first started work on the house two years ago, but they were on my husband’s phone, which got destroyed! So we lost most of the early renovation pictures. We have a few, but I haven’t had the opportunity to create any before and after blog posts. I’m hoping to eventually get around to doing that. We are in the North East and there are lots of old houses around here. This has been an overwhelming project so I really appreciate the kind words! Bummer about the phone. Good for you guys. Keep it up. 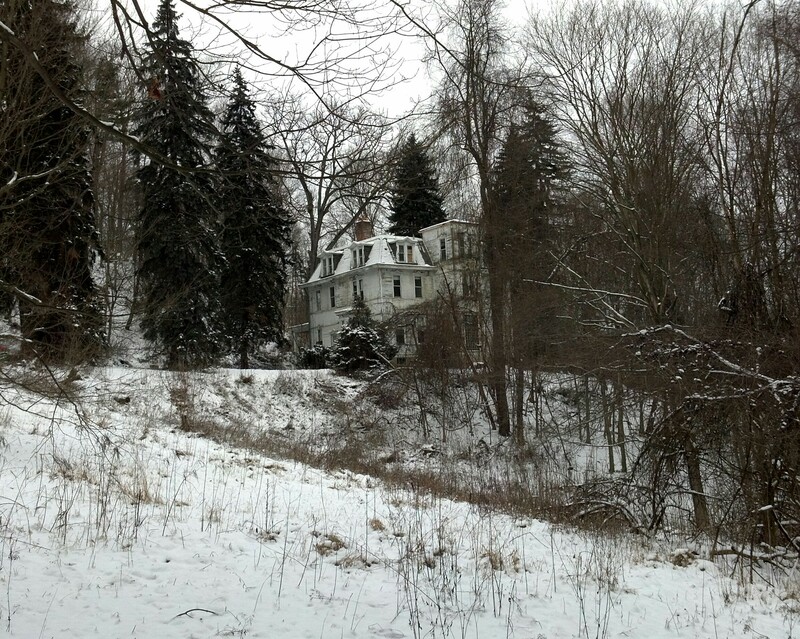 Thank goodness it was in good enough shape to stay there during the cold winter, right? We couldn’t stay in the house that first winter because there was no water or heat, but it has come a long way since then! 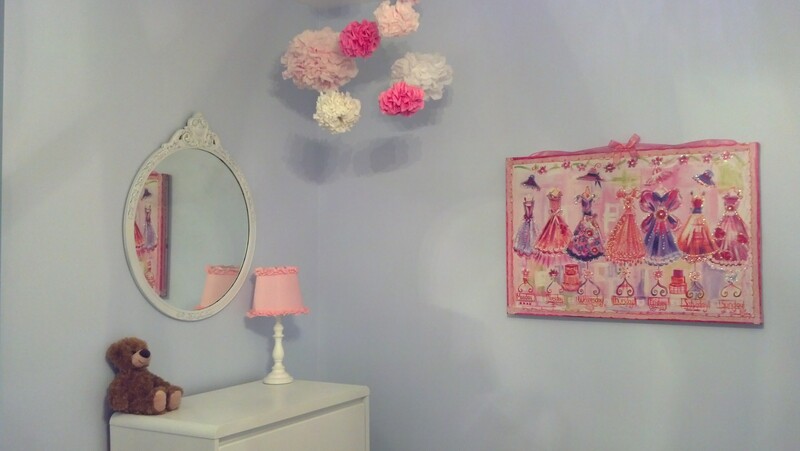 Your daughter’s new nursery is absolutely beautiful!! I’m so glad that you’re on the final end of your remodel. What a gigantic project. 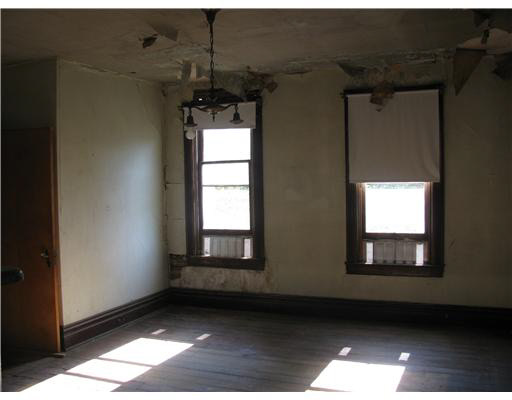 When we bought our place, we had walls torn down, a new kitchen, new bathrooms, and it was a nightmare. I was pregnant at the time and just wanted to set up my son’s room. Anyway, I think you did an amazing job and agree that blue works really well for a little girl’s room too. Plus, how awesome that you can use your great grandmother’s mirror AND the adorable bear from your own childhood? Love! Thank you. There was so much work to do in order to even make the house habitable (literally), but all that work was completed in less than a year. Since that time, we have been trying to get a handle on all of the finishing work. There are so many different finishing projects that we still need to complete that it’s overwhelming. Just trying to decide which project to work on whenever I get some free time makes me stressed. I kind of jump around from unfinished project to unfinished project. I can absolutely relate that massive renovations are a nightmare!!! I love old things and reusing items when I can. I figure, why should I buy something new if I can breathe new life into something old. I’m handy, but I wish I was more crafty. I love what you did with the room and I think that this shade of blue is totally unisex. Beautiful! Thanks so much. The whole house is a major work in progress! A little bit of painting last night, a little bit of plastering tonight, tomorrow night it will be installing a new light fixture.